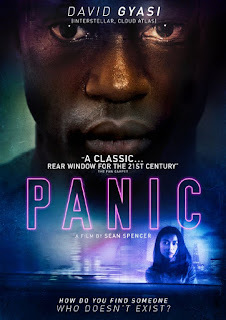 PANIC sees us following David Gyasi's music journalist character Andrew Deeley as he searches for a girl called Kem across London. You see Deeley has been cooped in his apartment for months after a brutal attack at a gig. Spending most of his days reviewing music and looking through his binoculars out across to the building opposite where Kem lives, reminiscent of REAR WINDOW.